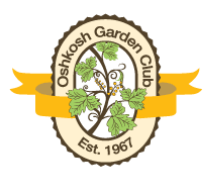 The members of the Oshkosh Garden Club would like to thank you for your generous gift. Our donors are truly the heart and sole of this organization and your financial support enables us to continue to follow our mission to provide educational, resourceful, and national networking opportunities for its members to promote the love of gardening, floral design, civic and environmental responsibility. Because of your support, we can aspire to leave a small ecological footprint, helping to create a more sustainable world where our needs and the Earth’s ability to meet them are in balance.